This story first appeared on RFTFL blog. LOS ANGELES, CA – It’s unfortunate that time and time again we have seen peaceful events grow to riots caused by an excessive show of force by the LAPD. For a bit of background- the chalk walk event was organized by a group of activists associated with Occupy Los Angeles to bring attention to the arrests that have been occurring at 626 Wilshire (the Central City East Association building). Arrests that have largely occurred due to activists chalking political messages outside of the building to bring attention to various initiatives being pressed forward by the CCEA to essentially strip downtown clean of people the ‘not-for-profit business corporation’ sees as undesirable. Since NBC is uninterested in doing any research to coherently articulate what the organizers intention was and since even the Artwalk co founder seems to be incapable of reading a press release or stay aware of what people in his community do; Let me state again. The purpose of Chalk Walk was to bring attention to the arrests that had been occurring at the CCEA. The action was planned to take place between 5th and 6th on Spring street and was intended to be a peaceful outreach event to encourage friendly dialogue. Many Artwalk regulars (parents and their children included) stopped by to draw with us. Many interesting conversations sparked from discussing MacKinney vs. Nielsen, the ninth circuit court of appeals decision that ruled that chalk could not be considered vandalism and was a constitutionally protected form of free speech under the first amendment. 8 arrests occurred between 7:30- and 8:45. All for – you guessed it – chalking. Everything remained peaceful during the first 7 arrests as the chalkers remained calm as they were taken into custody. The escalating incident happened during the 8th arrest. Apparently the LAPD wanted the chalk gone, the rain wasn’t working fast enough, and formed a skirmish line in front of the chalkers. Occupiers formed a line and started chanting. A lot of the Artwalk patrons were confused as to why there were riot police when no riot was occurring. A female art patron (not associated with OLA), trying to de-escalate the situation, walked in the middle of the two lines and drew a smiling stick figure. She was then tackled to the ground with such force that it caused her boyfriend to panic and lunge toward the police to protect her. He was shoved away by a couple officers. 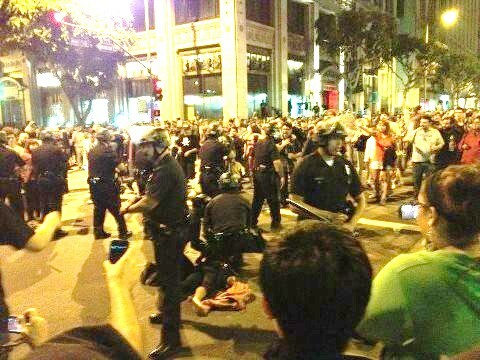 The womyn was then grabbed, flipped over, dropped face down onto the street and then pinned down by an officer’s knee. Her boyfriend was visibly upset and had to be restrained by 4 of his friends. It was at this point that a multitude of art walk patrons rushed into the street to protest her treatment. Tear gas was fired. As the crowd swelled, residents watching from their windows began to throw bottles at the police line. It was this excuse that LAPD took to begin firing rubber bullets into the crowd. 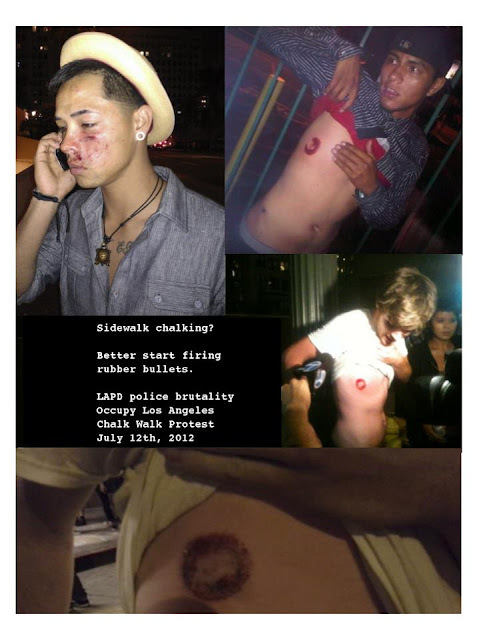 Some Artwalk bystanders were hit by the less- lethal ammunition* and suffered some pretty ugly injuries as a result. One man -not pictured below- was shot in his chest, had the wind knocked out of him and ended up collapsing right in front of the skirmish line. A few female protesters holding the front line rushed forward to help him and called for a medic. However we could not get to him before the police kicked the skateboard he was cradling into his face. As we were all forced to take a step back we watched as he was trampled over, flipped onto his face, zipped tied and dragged onto the sidewalk. At one point the police attempted a right flank to kettle protesters but everyone was able to get out of the designated area. We believe an additional 3 people were arrested as LAPD pushed the crowd North on Spring, none of which was associated with Occupy L.A. A couple hours and probably hundreds of thousands of city dollars spent on LAPD machismo later, the crowd naturally dispersed and continued along with their night. So- now the real nitty gritty- Why did this happen? This wasn’t about chalk, this wasn’t about ‘people provoking the cops’- it was about finding any excuse to lock up individuals speaking out about what is going on in downtown. The CCEA’s safer cities initiative is nothing more than a way to gentrify the area into a mono-socio/economic neighborhood that does not have to worry about “ethnic problems”. Harassing the houseless population of skid row and co-ercing them to leave is just the first step to expand CCEA’s current 97 block territory to cover the whole of downtown. Don’t believe the houseless get harassed without reason? Go to LACAN and talk to any of the individuals that work there and I guarantee you will have an entirely different perspective on what goes on in downtown. The safer cities initiative also lays out a plan that CCEA plans to implement by 2020 that would in essence clear out all of the businesses from Santee Alley. Skid row is comprised mostly of African American residents and Santee Alley is comprised mostly of Latino or Korean business owners. While this 2020 plan may not be intentionally racist, it certainly brings into question the morality of determining someones future or making decisions about someones livelihood in a way that will not benefit them in any way. As well as the morality of such decisions being made by people who only stand to benefit by other’s misfortune. In the end, this is all about economics and keeping money in the hands of the “right” people. This is outrageous. I feel sorrow that it has come to this. Our police-citizens have been trained and directed to respond with military tactics toward even the most harmless expression of the citizenry. This is one more incident that affirms my participation in regime change. We have symbolically begun an Occupied Economy, an Occupied Governance, and an Occupied Culture–a Threefold Occupation replacing the United States. We offer three new flags–a Solidarity Economy flag, a Humanocratic Governance flag, and a Diversity Culture flag–in place of the United States flag. To see, please click on my name at the beginning of this comment.